Now We have to determine the total volume of wall for brick work. To get actual volume of brick work. subtract the all window and door volume. You will get accurate number of brick required. Suppose i am having a 20cm thick wall with some dimensions. And there are a gate and window is also available in design. Then we have to find the number of bricks required to built this wall. Let’s start and do all the calculation step wise. 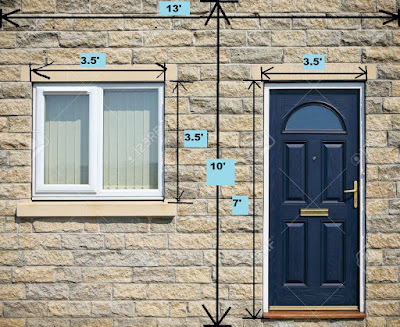 We don’t have width of the door so, to determine it’s volume we use width of wall here. Finally we don almost calculations now we have to find number of bricks required to build this wall.